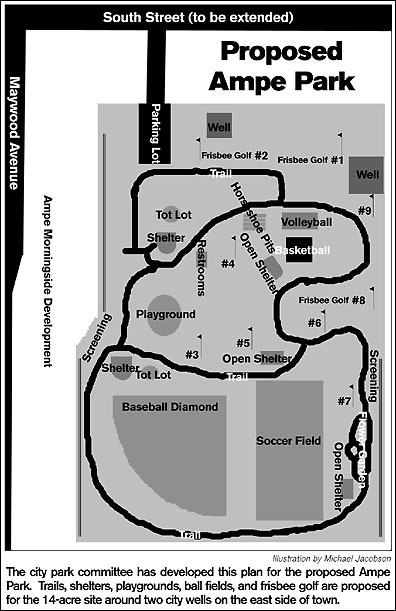 The city of Paynesville's park and tree board has proposed a plan for the new Ampe Park on the east side of town. The park committee, which meets next on Thursday, Sept. 14, at 12 noon at city hall - is seeking input about the plan for the new park. The city acquired this 14-acre property in order to drill two city wells. It was looking for a "clean activity" for the property while protecting the city wells, said public works director Ron Mergen, who coordinates the park committee, which has been working on the park plan for a year. The east end of town has seen 30 new houses built in recent years, and new developments plan to add another 50 homes in the vicinity, illustrating the need for the park, added Mergen. The park committee has developed this proposal, though the features for the park would need to be built in phases, most likely over five years or so. The park committee is going to be making a formal capital improvement plan for the park. Anyone with comments or questions about the park proposal can either come to a park committee meeting, can write a letter to the park committee (sent to city hall), or can contact Mergen at city hall.